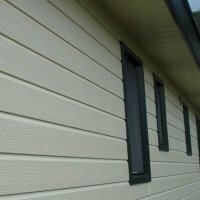 DURASID® is a complete cladding system that can be used for new buildings and renovation : ideal to be used in housing, static park homes and industrial buildings. The core is made out of cellular PVC-U with a coextruded top layer. The system is an aesthetic alternative to traditional claddings..
Durasid has the charm and appeal of natural wood plus the ease of maintenance of plastic, which has allowed it to quickly establish itself as a smart and fully-fledged alternative to other other external wall coverings made from commonly used materials. Durasid Corner Profile / Angle 50mm X 100mm for Original Sidings. Available in 6 colours. 5 metres..
Standard Double Siding Connector for Original Sidings. Available in 6 colours. ..
Invisible Double Connector for Double Siding Original Sidings. Available in 6 colours. ..
Center H-Section Joint for Original Sidings. Available in 6 colours. 5 metres..
Durasid Two-Part Edge Trim Snap down for easy installation.Select colour required..
Durasid Two-Part Internal-External Corner for Original Sidings. Available in 6 colours. 5 metres..
Durasid Starter Trim. Available in white only. 5 metres..
A ventilation profile for Durasid Original sidings. Available in black only 2.5m Length..